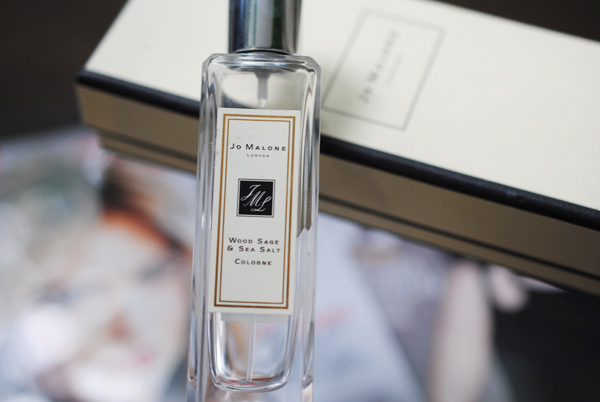 I thought I'd start a series on the blog called 'YouTube Made Me Buy It" because I have bought so many great and not so great things based on the recommendations of my favorite beauty vloggers on YouTube. 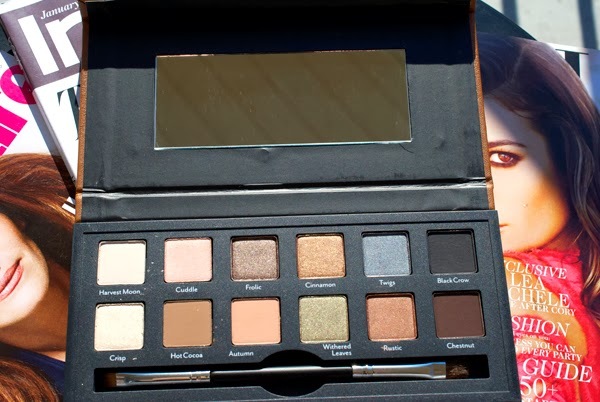 About a month ago, one of my favorite YouTubers, Tati from GlamLifeGuru, posted a review on the Cargo Cosmetics Vintage Escape Fall Eyeshadow Palette. She could not get enough of the colors and the quality of these shadows! I immediately fell in the love with the shades in the palette, so I asked for it for Christmas. I played with it today and love it so far. Check out my first impressions review below! This is actually my first Cargo Cosmetics item, which I'm really excited about. Cargo, a mid-to-high-end makeup brand, is frequently on HauteLook.com at discounted prices. Many if not most of the brand's products contain parabens, so that's why I've stayed away. 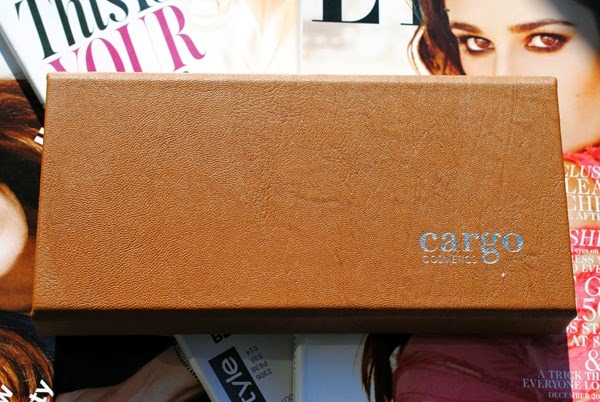 I now know that most Cargo eyeshadows are paraben-free, which is great. Cargo Cosmetics Vintage Escape Fall Eyeshadow Palette $39 was released as part of the Fall 2013 Vintage Escape collection, which I believe was limited edition. Like most Cargo eyeshadows, this palette is paraben-free. Tati did mention that she bought her palette at one of those new fancy Walgreens near her area (I believe she's in California). I was able to find this online at Kohl's and saw that the palettes were in stock at the Kohl's near my parents' house, but unfortunately now it's gone from the site. Unfortunately, it is not available on Cargo Cosmetics site either. BeautyBay is selling it for $57.40, which is a bit ridiculous, but you could still try going into a Kohl's or Walgreens store if there are any in stock. CARGO Vintage Escape Fall Eye Shadow Palette features smokey neutrals, browns and charcoal hues to create this season’s hottest eye looks. Packaged in a faux leather effect casing, Vintage Escape Fall Eye Shadow Palette is reminiscent of a distressed leather journal and aligns with CARGO’s rustic autumnal theme for the Vintage Escape Collection. Featuring 12 sensational shades of neutral, smokey browns and luscious charcoals with a boost of autumnal colour, Vintage Escape Fall Eye Shadow Palette is this season’s essential palette for a creative mind and the hottest looks. Harvest Moon is a matte vanilla. Cuddle is a satin light pink. Frolic is a shimmery taupe (it's much cooler in real life than in the swatch). Cinnamon is a shimmery bronze-gold. Twigs is a satin steel blue. Black Crow is a matte black. My favorites in the top row are Frolic and Cinnamon. Twigs and Black Crow are the least pigmented of the bunch. They are all buttery soft! Crisp is a shimmery light yellow. Hot Cocoa is a matte medium warm brown. Autumn is a matte warm light brown. Withered Leaves is a shimmery medium green (it looks a little brown in the swatch). Rustic is a satin warm brown. Chestnut is a matte dark chocolate brown. I can't choose a favorite in this bunch, they're all gorgeous, buttery and super pigmented! 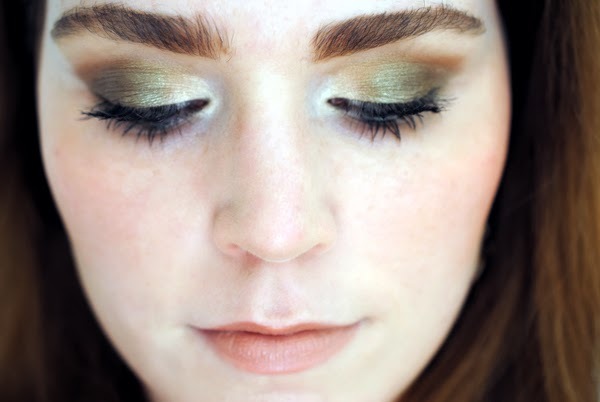 Here's my first pass at a look with the Cargo Vintage Escape Fall Eyeshadow Palette! I prepped the lids first with NYX's Eye Shadow Base in White. 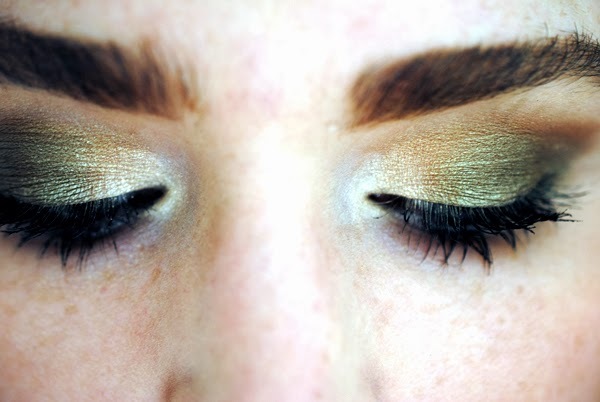 On the inner corners and inner half of the lids, I applied Crisp, they light yellow shimmer. On the middle of the lids and towards the outer half, I patted on Withered Leaves, that shimmery green shade. I then blended the crease out with Autumn, the matte light warm brown. 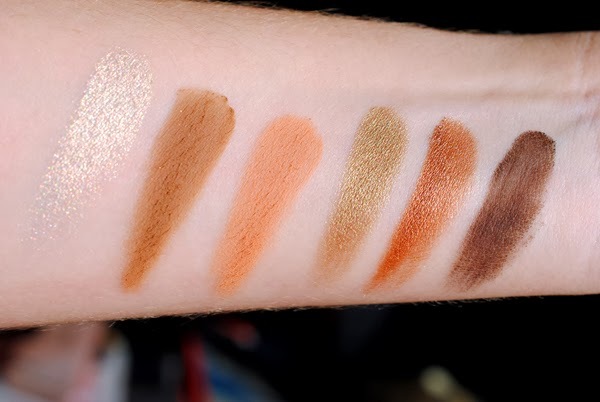 Autumn is similar to Makeup Geek's Crème Brulee. Once I had blended my crease, I went back in with some MAC Fix+ $21 on my flat shader brush and patted more Withered Leaves on the middle of the lids, as the color had faded a little bit with the blending. Finally, I took a pencil brush with Withered Leaves and very lightly smoked out the lower lashline. For eyeliner on the upper and lower waterline, I used Jordana 12 HR Made to Last Liquid Eyeliner Pencil $2.49 in a forest green shade called Jade Jewel. After curling my eyelashes as usual with my Tarte eyelash curler $16, I primed my lashes with Tarte's MultiplEYE Clinically-Proven Natural Lash Enhancing Primer $22 and went over it with L'Oréal Telescopic mascara in Blackest Black $9.99. The Tarte lash primer is great as it nourishes and protects the eyelashes, and adds lots of thickness. 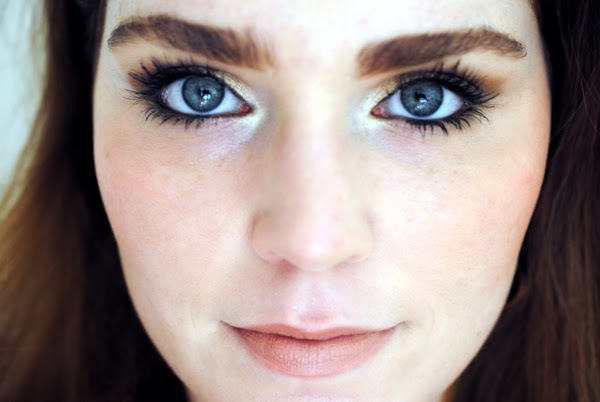 I love layering this with a lengthening mascara like Telescopic because this way I get tons of volume and length. Final First Impression Verdict: Love at first sight of course! Tati steered me in the right direction :) Ten of the twelve shadows are incredibly pigmented, all of them are wonderfully buttery, and I love the mix of matte and shimmery shades. Yes, these colors scream "Fall," but of course they can be used year-round. I am incredibly excited to explore this palette in 2014. Do try to find this palette in stores at Kohl's or [fancy] Walgreens while you still can! 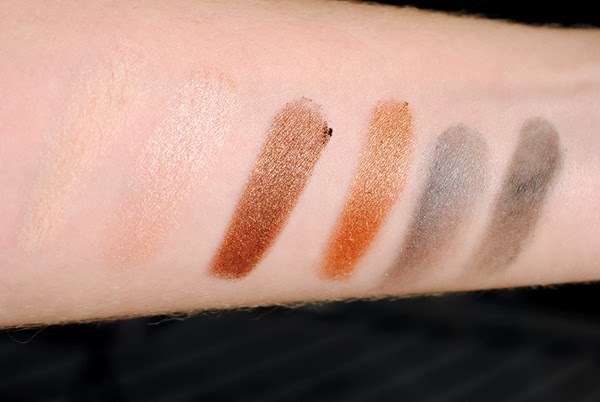 Cargo Vintage Escape Fall Eyeshadow Palette was a holiday gift from family. Cargo Vintage Escape Fall Eyeshadow Palette is paraben-free. The eyeshadows and palette are bulk made in USA and assembled in Dominican Republic. The shadow brush is made in China. Does the Naked Palette have parabens in it? Hi! According to Sephora and Urban Decay, the Naked 3 palette, the Naked Basics palette and the Naked 2 palette are paraben-free, but the Naked 1 palette is not. Gooooorgeous! Love the look of the shadows and the eye look you created was flawless :) Also you have STUNNING eyebrows! haha that might be a weird compliment but It's true, they're amazing!